We are increasingly asked to read different things in different ways – from emojis to social media feeds, speed reader phone apps to public information screens. This combination of new locations and new forms of text makes reading both more common, and more difficult to grasp – putting pressure on our attention and reading abilities, and demanding new forms of literacy. 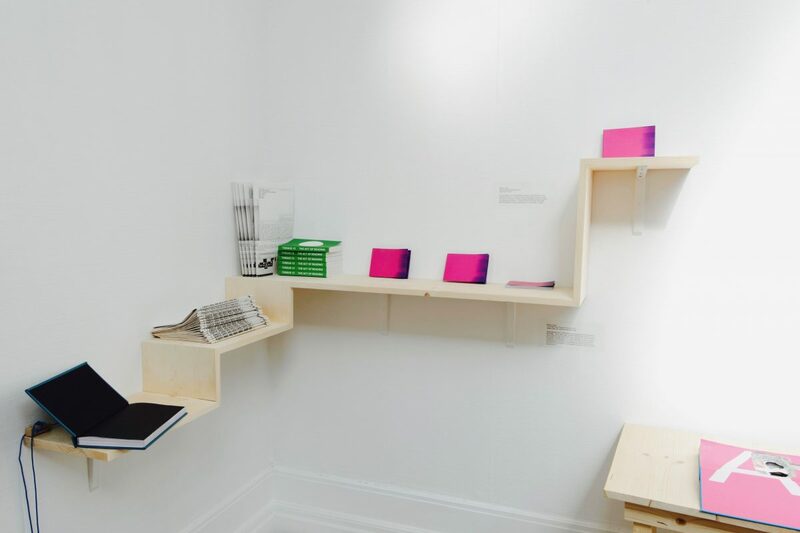 The exhibition Relearning to Read functioned as an alternative library-like space, showcasing how artists can offer different and experimental ways of reading and writing which might help us navigate the new textual environments we now inhabit. Many of the works played with the space between more traditional print-based and analogue media and newer digital technologies. Downstairs in the foyer, audiences were invited to bring along their own books or borrow books from the library next door, to use on a new “reading machine” made in collaboration with Tom Schofield. 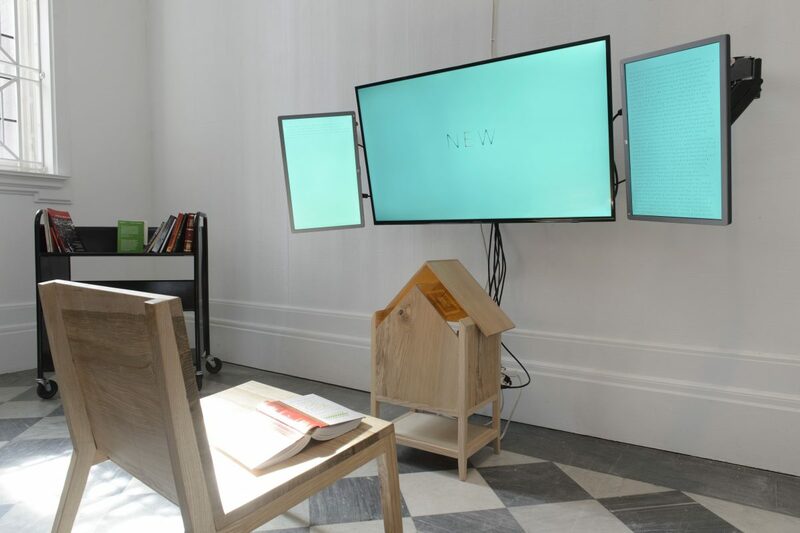 To activate the machine, readers placed their book on a scanner which converted their analogue text to digital, which was in turn translated into a speed reading display. The scanned text was then analysed using a form of AI looking for ‘interesting’ words and then reformulated into text that the computer attempted to write and communicate with. This project was generously supported by Grants for the Arts – Arts Council England. An original excerpt from a book by philosopher Villem Flusser, about how human reason works like a knife, is adapted over 100 times via a voice recognition programme. The computer’s own reasoning – how it (mis)interprets various voices, of the artist and her daughter, and of synthetic speech software – is re-read into the interface to produce more adaptations. Presented as a series of long lines to be read left to right, or a sequence of phonemes read top to bottom, the resulting text becomes a map, where we can read clusters of the errors, retentions, adaptations and gaps charting the relationship between the reader and the computer software and generating new associations and narratives. The scales of this map demand a very particular kind of reading also a combination of the large and small in which the body is required, just as much as the eye, to explore the text. Each of these architectural models depict a room designed for reading a particular novel in. The fragile materialities constructed in the mind as we read novels are re-imagined here as environments that envelop and enclose the reader, brought one step closer to our real world experience through a clever adaptation of materials. For example, the “onyx wall” of Simon Mawer’s 2009 novel The Glass Room, is produced here in soya wax, and the absurdist metaphorical world of Edwin A. Abbott’s Flatland is evoked through an intersection of card angles and arches. Using a sentiment analysis tool to classify all the artist’s written documents throughout the whole of 2015, into positive, neutral and negative, a text was created from only those categorised by the algorithm as negative, which were then organised in order of increasing negativity. The video documents Scourti reading this text along with a speed reading app. It constitutes a vertiginous experience, a rereading and reperformance of the artist’s descent into depression and her inability to keep pace with personal, professional and intellectual pursuits during during this year. The video captures Scourti’s panic and urgency in relation to the daily pressures to keep moving and improving, alluded to in the video by an efficiency app. Overlaid and cut in with screen-recorded video of online searches as well as camera uploads from her own archive, Negative Docs points to the deleterious effect of digital technologies on our mental health, particularly the way our attention is captured and wrung out for for commercial ends. A device which turns a print book into a speed reading experience. Scanning the book, speed reading software displays the text a word at a time. Speed readers are often advertised as efficiency devices, but the form and finish of this structure is designed to suggest a deeper, perhaps more involving relation between books and readers. 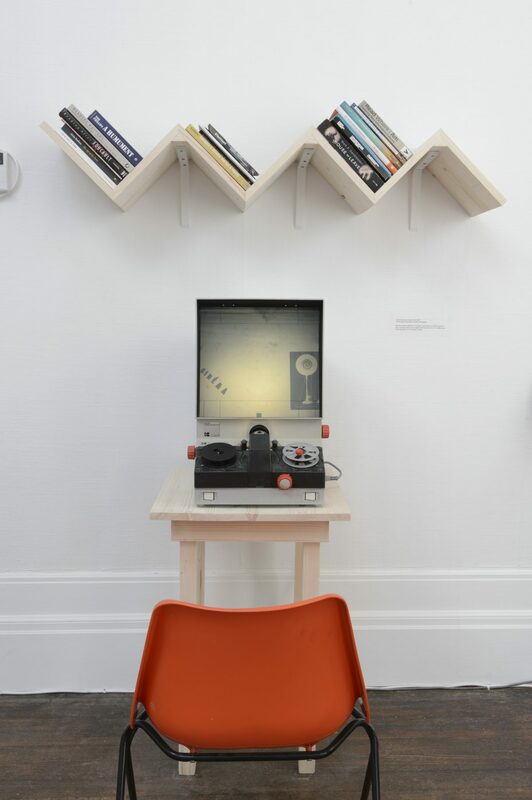 The work suggests an esoteric form of the postdigital, where computers don’t replace, but augment and transform our experience of the book. Place your book on the scanner and pay attention to the screens as The Rereader plays the text to you at up to 1000 words per minute. The typeface is designed to replicate natural forms for minimal cognitive friction, and work with the mind’s use of intersecting contours to recognise objects creating a more liminal reading experience. The single-word display allows you to absorb the information from the book without moving your eyes through a body of text as in ‘normal’ reading. The rereading finishes with a sequence of images, close-up textural studies of the now empty page. The Rereader itself also learns to write from the books that it sees, using an artificial intelligence (AI) algorithm. See video documentation here. In The Man Who Knew Too Much, James Stewart is told an important secret by a dying man. An assassination will be committed in London. Our hero must tell the authorities about a mysterious “Ambrose Chapel”. All along the film, Stewart is searching for this man until he realizes that what he was looking for was not a man, but a place, the Ambrose Chapel. Like Hitchcock’s character, an OCR program knows a secret it shouldn’t: there is a language that speaks through every image. And like the Hitchcock’s character, it assumes too much. Behind any configuration of pixels, it sees a letter waiting to appear. And, knowing too much, it doesn’t know enough. And yet. Is it so wrong? So wrong to see an alphabet germinating in the images of the city? Isn’t there a typography of light that distributes the shape of the walls? A calligraphy of shadows that draws faces and expressions? TSWKTM is made using a modified version of the OCR program Tesseract. An OCR program is usually configured to detect lines of words in documents. For this project, we asked the program to detect everything it considers a possible character, even if this character is not part of a word. This leads our script to see letters and punctuation marks in many unexpected places. The script analyzed various YouTube amateur and promotional videos about Blackpool. The videos on display show all the frames where the script found letters or punctuation marks. Watch video and details of book of the project here. 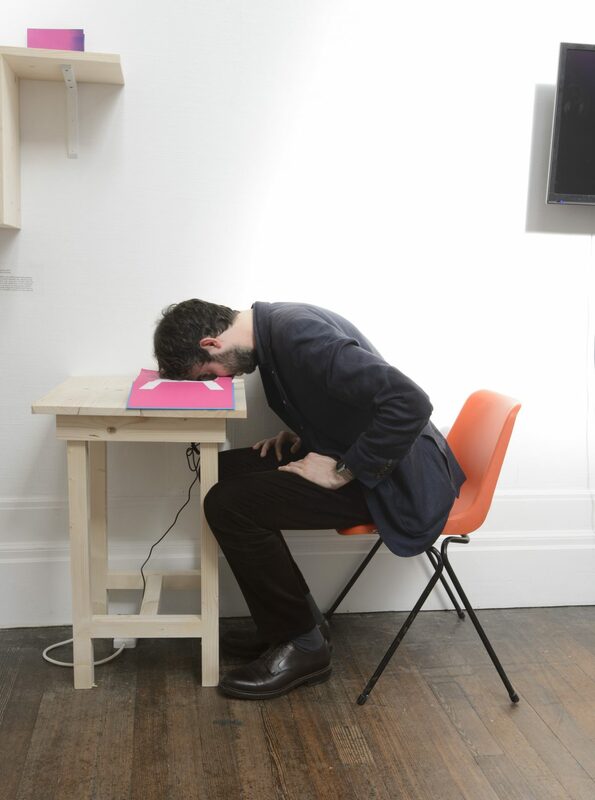 Using elements from a VR headset, two similar poems are played to the reader – one to each eye. The visual cortex produces a variety of responses, including meshing different words, flickering its attention between the two, and reading both at once. The poem is set into a table for a more relaxing reading experience. A poem drawn from the Compline (or Prayer in the Evening), set for flicker-book. Readers focus on one line at a time while flicking through to read the poem in its entirety. The eye and page together produce an effect akin to that of a digital text animation. 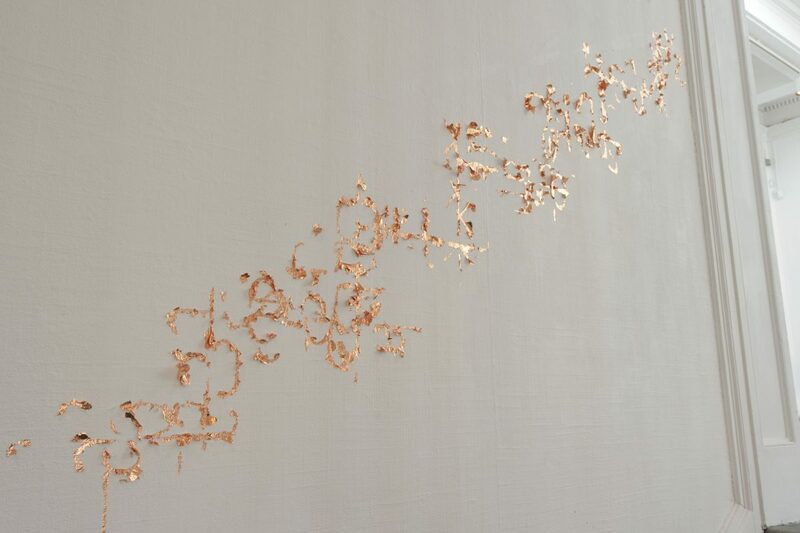 Words that start with “re”, set in copper leaf, are distributed in alphabetical order up the stairs leading to the upper gallery. Verbs such as ‘reconfigure’ are followed by nouns such as ‘reconnaissance’ to form a mantra like rereading of this particular lexicography. Etymologically ‘re’ is a word-forming element meaning “back to the original place; again, anew, once more,” also with a sense of “undoing,” c. 1200, from Old French and directly from Latin re- “again, back, anew, against”. Browse a linear offline selection of Torque’s web history of over 2000 saved pages on 16mm archival film, including essays and imagery that have informed the project and document our activity to date.